In this article, I will address a couple of popular questions and answers for criminal inadmissibility and foreign nationals who are denied entry into Canada. There are several different questions that revolve around criminal inadmissibility as it is a broad category that includes many foreign nationals. The best options to overcome your criminal inadmissibility to Canada is to either apply for a Temporary Resident Permit or a Criminal Rehabilitation. If you feel as though you would be eligible to apply for either of these applications, I suggest you read our article on “Temporary Resident Permit Compared to Criminal Rehabilitation” before reading this question and answer article. The intention of this article is meant to clarify any misunderstanding or confusion regarding criminal inadmissibility and foreign nationals who are denied entry into Canada. Q: What does an Immigration offence entail? A: An Immigration offence pertains to Sections 117 through to 150 of the Immigration and Refugee Protection Act, also referred to as the abbreviation IRPA. The Act directly deals with offences under the IRPA that contain offences such as human trafficking, possession of fraudulent documentation that contravenes the Act, and other general offences including misrepresentations. An Immigration offence is a very serious offence and it is best to abide by the regulations of IRPA. Q: How does a detention work in Canadian Immigration? If the foreign national or permanent resident has not established their identity to Canadian authorities. 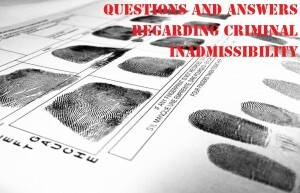 Q: What is the most common offence that results in criminal inadmissibility to Canada? A: The most common offence that results in criminal inadmissibility to Canada can most arguably be a “Driving Under the Influence” offence. This offence can be referred to as a DWI, DWUI, OMVI, OVI, and many more. Q: My family and I tried to apply for permanent residency in Canada but we were all found inadmissible due to my teenage daughter having a conviction for “Driving Under the Influence of Alcohol.” This was very shocking and shattering for the entire family as we have established ourselves in Canada and have made this country our home. Our application was sent to the visa office for re-determination; however, my daughter was sent back to our country of origin due to her conviction. My question is, how long does it take for a re-determination and how can my family be reunited with my daughter? A: This specific scenario happens more than you know so I’m happy that you asked this question although the circumstances are very unfortunate. To answer your question, there, unfortunately, is no expected time frame for a re-determination. The processing time entirely depends on the number of applications that are being processed, the number of staff at the visa office and many more factors. However, in most cases, it takes a couple of months for your application to be re-assed and re-determined. Furthermore, in order for your daughter to reunite with your family, you will have to either apply for a Temporary Resident Permit or a Criminal Rehabilitation, depending on how much time has passed since your daughter completed all the sentencing of the offence. If your daughter decides to apply for a Criminal Rehabilitation and she receives an approval, she will be able to enter Canada and dissolve her inadmissibility. This is so long as she does not reoffend; if she does, then the Criminal Rehabilitation will be void. Q: I attempted to enter Canada to visit some family members I have in Ontario; however, I was refused entry apparently due to my health problems. I was not aware that I could be denied entry for medical reasons. Is there any way I can appeal this decision made against me? A: Unfortunately, an Immigration officer can deny the entry of any foreign national due to medical inadmissibility. The medical inadmissibility can be determined if the condition of the foreign national can potentially endanger the health and safety of Canadian society and/or the admission of the foreign national can potentially cause an excessive demand on health care serices provided by the Canadian government. Furthermore, if the Immigration officer determines that you will cause an excessive demand on health care services that would exceed the amount spent on the average Canadian over a period of five years, they can deny your entry. You may appeal this decision; however, in order to receive a successful decision on the appeal, it entirely depends if the Immigration officer thoroughly assessed your doctor’s diagnosis, your current condition, and most importantly, the exact amount of the average demand by a Canadian on health care services in a similar scenario. Should you have any further questions or feel confused or unclear about your criminal inadmissibility or your denial of entry into Canada, it is important to talk about and ask all questions you may have and discuss your concerns to an immigration professional. By talking to immigration professionals about your concerns, this will ease your worries and assist with the application process. Many immigration applications are difficult to pursue on your own and it is highly recommended that you seek out professional and experienced help before attempting to apply. Here, at Akrami & Associates, we work and have experience with many different immigration issues. We have helped many of our clients overcome their criminal inadmissibility by applying to the appropriate application for their specific circumstances. If you believe that you may be eligible to apply to overcome your criminal inadmissibility, please feel free to contact Akrami & Associates at our office at 416-477-2545 for more information or if you would like to book a consultation with an immigration professional for more advice. With Akrami & Associates, there is always a way!